KARACHI: Industrialists from Chengdu, the economic hub of southwest China, have shown interest in establishing an ‘industrial incubator’ in Pakistan with focus on technology transfer as well as a ‘Pakistan Commodity Centre’ in Chengdu to promote trade between two countries. As Pakistan and China are moving towards greater economic cooperation, a nine-member delegation of Chengdu Chamber of Commerce for Commercial Services (CCCCS) was recently on a visit to Pakistan where they explored the opportunities to establish an industrial zone either in Lahore, Karachi or Gwadar. Sharing the initiative to boost trade and economic ties and bring massive investment in Pakistan, Professor Song Zhihui, the strategic partner of the CCCCS, said they held positive meetings in this connection with all the stakeholders, including Karachi Chamber of Commerce, Sindh Board of Investment, furniture manufacturers and other government functionaries, adding that they also went to Bin Qasim Industrial Park during their Karachi visit. Meanwhile, Naheed Memon, Chairperson Sindh Board of Investment, termed the meeting with the delegation very positive, adding that the both sides identified a few areas for further work. Briefing on the plan, Li Tiansu, Chairman CCCCS said besides establishing an industrial incubator the trade body is also mulling to establish a Pakistan Commodity Center in Chengdu, on the lines of Chengdu European Center, where agriculture products, furniture and marble products from Pakistan would be displayed to be sold in local market. Balancing trade deficit between the two brotherly countries is one of the core principles, Li stressed. Another member of the delegation, involved in logistics business, stated that sectors the CCCCS looking to invest in include ceramics, garment, automobile, electronics and information technology. With aim to enhance economic cooperation in the region, the CCCCS has posted guidelines on its website for small and medium enterprises to "go abroad" and integrates into the investment to create sound environment for economic and technical cooperation between foreign countries and China. It adds that the chamber is now making great efforts to invest and establish industrial incubator, introduce advanced industries in China, and promote industrialization progress in Pakistan; using project, technology and funds as support, it helps Pakistanis obtain employment, and improve living standards. Chengdu is a software base in China so transfer of technology in IT is another important element of our business model along with Research and Development facilities, labour training and localization of industries. With the road and rail networks being improved under the China-Pakistan Economic Corridor (CPEC), China Logistics Corporation is looking to facilitate transportation of goods to and from Sichuan, just like China-Europe freight train service, Prof Song, who is also the Executive Director of Pakistan Study Centre at Sichuan University said. The delegation also had a very fruitful meeting with the management of China Overseas Ports Holding Company Ltd. along with Dostain Khan Jamaldini, Chairman Gwadar Port Authority. The entrepreneurs expressed their strong interests in investing and starting business in recently inaugurated Gwadar Free Zone. Some of them even made decision to participate in the coming Expo and Trade Fair in Gwadar. The visiting delegation was comprised of Li Tiansu, Chairman CCCCS; Li Hongwu, Chairman of Chengdu Kaixin Group; Gou Lin, Assistant of Prof. Song Zhihui; Ren Chenglong, Chairman of Sichuan Zhenxinkechuang Industries; He Jian, Deputy General Manager of Sichuan Hongyu Kaixin Real Estate Development; Yin Houjian, General Manager of Sichuan Yuxin Pharmaceutical; Cheng Jianping, Chairman of KOCCIO; and Liu Sihan, General Manager of Sichuan Headspring Trading. 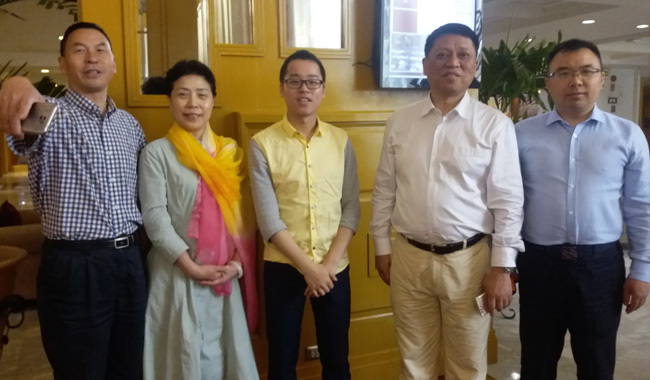 (L-R) Prof Song Zhihui, Chen Jianping, Gou Lin, Li Tiansu and Li Hongwu pictured during their Karachi visit.